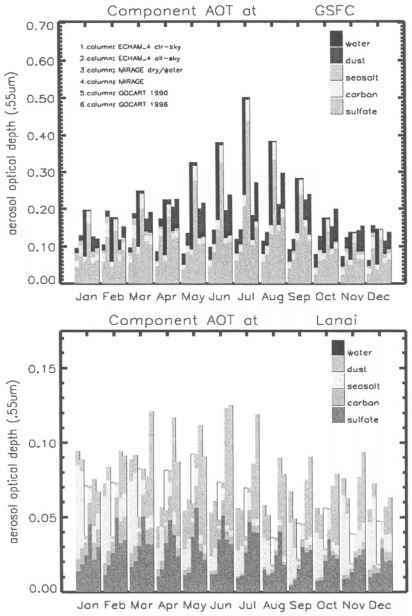 The partition of modeled total aerosol optical depth into components of dust, sea-salt, carbon (black carbon and organic carbon are combined) and sulfate are presented in Figures 6 and 7 (for the four sites that were introduced in Figure 2). In Figures 6 the component optical depths of all five models are presented, along with AERONET total optical depths for reference. In Figures 7 the component optical depths among different model versions are compared. Results from three pairs of model versions are presented to illustrate the (modeled) impact of nearby-clouds on aerosol optical depth (ECHAM4 vs. ECHAM4, clr), to indicate the fraction of water in aerosol (MIRAGE vs. MIRAGE-dry) and to demonstrate year-to-year variations (GOCART, 1990 vs. GOCART1996). Figures 6 and 7 demonstrate that the (modeled) total aerosol optical depths are always comprised of contributions from many aerosol components. Contributions of carbon, dust and sulfate are frequently comparable in magnitude. Near water, sea-salt contributions become comparable as well. Thus, an accurate treatment of each component is important. This also means that assuming aerosol component mixtures, rather than pure aerosol components, may be a much better choice for a-priori assumptions in satellite retrievals of aerosol (e.g. Kahn et al., 1999). 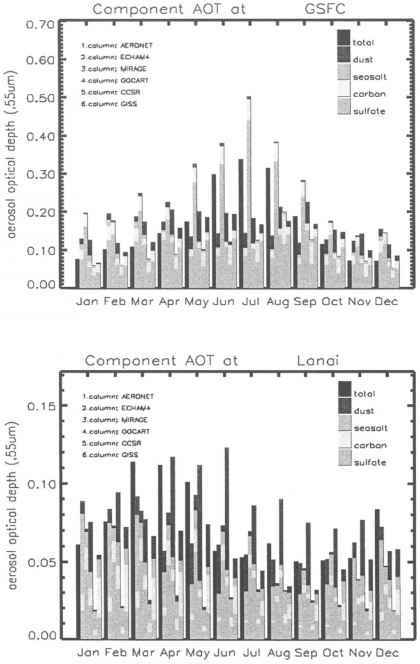 Nonetheless, there are a few AERONET sites, where (at least for part of the year) the optical depth contribution of one aerosol component dominates. These sites are important for the evaluation of aerosol component modeling. 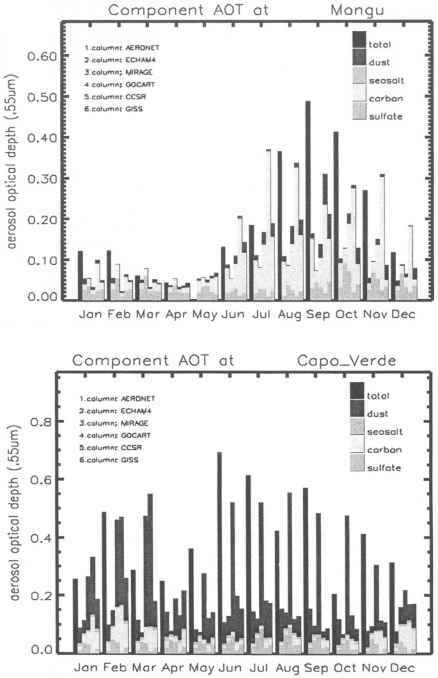 For this reason comparisons at AERONET data are always given for four sites: Mongu has large carbon contributions in late summer and fall, Cape Verde has large dust contributions with two maxima in late winter and summer, at GSFC sulfate contributions are expected to dominate site and at Lanai sea-salt contributions should be significant. Compositional differences among models with respect to locations are expected. Some of the differences in component optical depths are summarized next. CARBON- Modeled carbon optical depths are usually too small. At sites near biomass burning only CCSR comes close to AERONET totals. The four other models, especially MIRAGE, miss in magnitude for these seasonal events. Away from regions of biomass burning, carbon contributions of ECHAM4 and GOCART are smallest. Reductions in carbon optical depths with the cloud-removes sub-set remain small. Assimilations with meteorological data from different years are not too significant, although there is potential for significant differences with temporal shifts for dry and wet seasons. DUST- Modeled dust optical depths are usually much too small. Near dust sources only GOCART and at times CCSR match the large optical depths of AERONET statistics. Suggestions of lower (often up to one order of magnitude lower) optical depths are quite common. MIRAGE dust optical depths are particularly low. Away from dust sources GOCART carbon optical depths are too large. Year-to-year variations can be significant due the dependence of dust-mass on near-surface winds and precipitation (soil wetness). SULFATE- Sulfate optical depths differ strongly among models and with respect to AERONET averages at sulfate dominated sites. 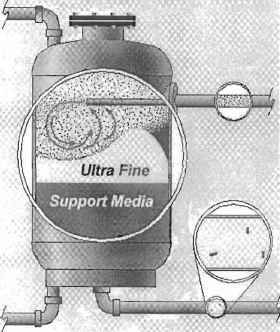 MIRAGE usually suggests the largest (and often too large) sulfate aerosol optical depths. In contrast, CCSR values are clearly too small. Sulfate optical depths in ECHAM4 and MIRAGE display a high sensitivity to ambient relative humidity. This is also reflected in strong reductions of (too) large sulfate optical depths during northern hemispheric winters with the cloud-removed data subset. SEASALT- r. Sea-salt optical depths over land are usually insignificant compared to dust carbon or sulfate. Even for near-ocean sites sea-salt optical depth contributions are not dominating. The strong seasonality for ECHAM4 values is driven by its sensitivity to ambient relative humidity. However, there is no clear tend from with the cloud-removed data subset. AEROSOL-WATER- r Contributions of water are about half of the total aerosol optical depth at maritime and urban-industrial sites. Aerosol water contributions easily separate dry and wet seasons. For the northern hemisphere, optical depths related to aerosol water are often largest during winter, despite usually larger aerosol optical depths in summer. Comparisons of Figures 6 and 7 addressed interpolated model values. To demonstrate that the sampled model tendencies apply on larger spatial scales, model comparisons were also conducted for large regions. Component aerosol column optical depths of all five models are compared for four different ocean regions in Figures 8: the NW-Atlantic is heavily influenced by urban-industrial pollution (sulfate and carbon), the E-Atlantic is dominated by dust, the SE-Atlantic has strong contributions from biomass burning during the first months in the years and the W-Pacific was added as a mixed site. For comparison purposes in Figures 8 AVHRR-giss optical depths averages based on NOAA-9 data (explained earlier) are presented. AVHRR regional averages are usually larger than averages suggested by models. Note that E-Atlantic AVHRR averages are likely underestimates (due to removal of optically thicker dust cases during cloud-screening). 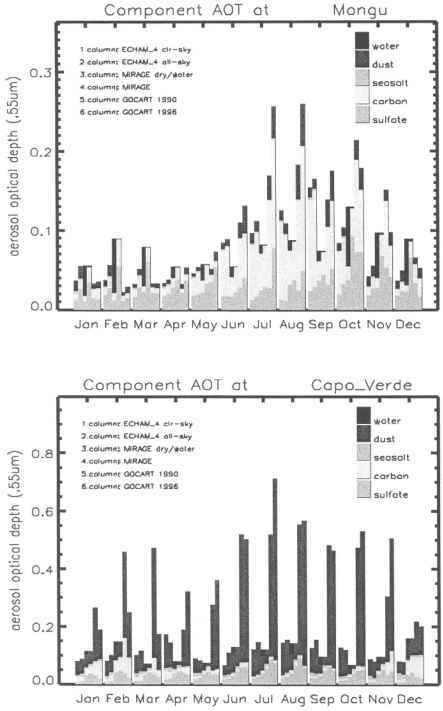 This confirms the trend of models to underestimate aerosol optical depth from comparisons at AERONET sites. Total aerosol optical depths among models are often similar but quite different in their component partition. The optical depth component trends of models from local comparisons are largely confirmed: GOCART provides the largest dust optical depths. MIRAGE stands out with the largest sulfate optical depths, which in part offset deficiencies for carbon and dust. CCSR suggests one of the larger carbon contributions and compensates in part for small sulfate values. ECHAM4 and MIRAGE display the strongest humidification effects. To understand component optical depth tendencies of models, the component aerosol column mass is compared and assumptions for their conversion into optical depth are examined.